in one of the most significant of environment cases, on April 2, 2007, the us Supreme Court ruled that the country's environment agency had the authority and responsibility to regulate carbon dioxide emissions and other greenhouse gases (ghgs) under the Clean Air Act, 1963, as an "air pollutant". The court was hearing the Massachusetts et al vs Environment Protection Agency (epa) et al case filed against epa by Massachusetts and 11 other states, and environmental groups and others in 1999 petitioning epa to set carbon dioxide emissions standards (see 'us court warms up', Down To Earth, January 31, 2007).Air pollutant or GHG? epa had argued that the Congress designed the original act to address local air pollutants rather than ghgs that were "fairly consistent in its concentration throughout the world's atmosphere". epa claimed that even if it had the authority, it would decline to do so since the regulation would conflict with the Bush administration's priorities. The 5-4-majority judgment against the epa and the administration rejected epa's arguments saying the act expressly permitted the regulation of ghgs. The court demanded scientific grounds for epa's refusal to decide whether ghgs cause or contribute to climate change rather than policy or political reasons. 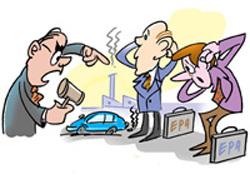 It called epa's action "arbitrary, capricious or otherwise not in accordance with law". Other issues epa argued that it could not regulate carbon dioxide emissions from vehicles because it would require tightening mileage standards, which was the responsibility of the department of transport (dot). Refuting this, the majority of judges said dot's mandate to set mileage standards in no way licensed epa to shirk its responsibilities. epa had to protect the public's health and welfare, an obligation independent of dot's mandate to promote energy efficiency. The two obligations could overlap, but that did not mean the two agencies should not administer their obligations avoiding inconsistency. epa had also said that emissions regulations for new vehicles "might impair the President's ability to negotiate with 'key developing nations' to reduce emissions". But the court said, "While the president has broad authority in foreign affairs, that authority does not extend to the refusal to execute domestic laws." The question of China and India's emissions took centrestage, as epa and the administration argued that efforts by the us to cut ghgs would be offset by emissions from developing countries. The court agreed that developing countries would increase ghg emissions substantially over the next century but the majority of judges agreed that a reduction in domestic emissions would slow the increase in global emissions, no matter what happened elsewhere. Dissenting with the majority, the chief justice and three conservative judges said though global warming might be "the most pressing environmental issue of our time, how to deal with it should be resolved by Congress and the president, not the court". The judgment gave an impetus to the efforts to deal with global warming in Congress and among environmental groups. The ruling "repudiates the Bush administration's do-nothing policy on global warming", said the Natural Resources Defense Council, a New York City-based ngo. The judgment also removed legal hurdles that kept California and other states from checking carbon emissions in new vehicles starting 2009. Many us states and cities have taken independent initiatives to check global warming. According to the assistant attorney general of Massachusetts, James Milkey, who argued the case before the Supreme Court, the court decision affected not only the regulation of ghg emissions from vehicles, but also, by implication, those from other sources, such as fossil fuel-fired power plants. Now epa could not refuse to pursue regulations simply because it thought it was a bad idea. But ignoring the opinion on global warming among the public, and in the Congress and the judiciary, President George Bush said at a press conference held a day after the judgment that the measures taken by the government to curb ghgs were sufficient. He gave no indication that he would ask the epa to regulate ghg emissions. epa officials have said they are still reviewing the judgment.